The New Zealand mud snail reproduces like crazy, but is it a threat? A New Zealand mud snail adult on the finger of U.S. Fish and Wildlife Service biologist Keith Bensen. 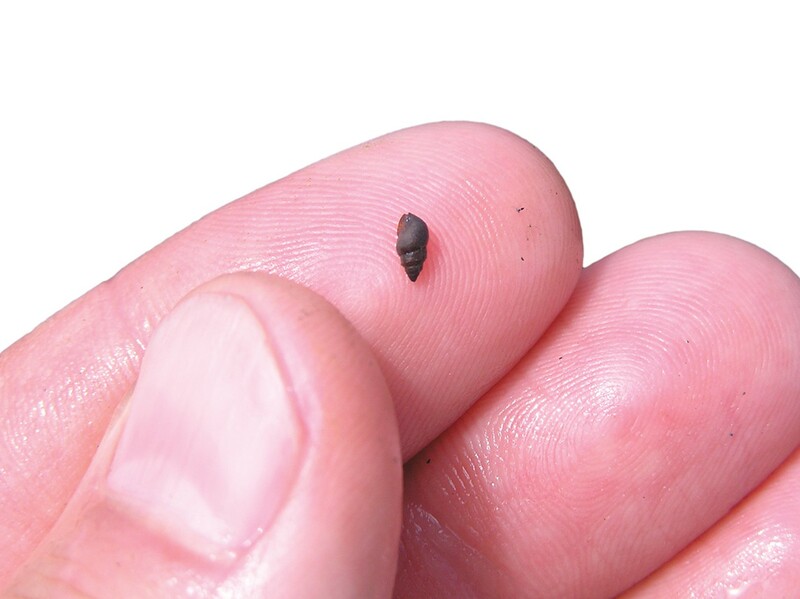 A New Zealand mud snail is a tiny thing, no more than a quarter-inch long, often less. A dime dwarfs it. In fact, a dozen or more of the critters can easily fit on top of a dime. Harmless, seemingly. And if you really look at them, with their attractively whorled, generally brownish, conical shells, they're kind of cute. So why is Keith Bensen, resource manager for Redwood National Park, running around these days as if the sky's about to fall? He's not, actually. But the snail does worry him. A lot. "My job, by law, is to protect the native ecosystem for the American people," Bensen said recently. "If an invasive species comes in and that ecosystem gets destroyed, then I'm not doing my job." The New Zealand mud snail, as its name indicates, comes from south of the equator, so if it's here in Humboldt County it's by definition an invasive species. And it is here. In Freshwater Lagoon, Big Lagoon and in the Redwood Creek estuary -- not to mention farther north in Lake Earl, in the mouth of the Klamath River and over the border in Oregon's Rogue River. It's a pest in the way ants are pests -- a single individual is hardly noticeable, but a swarm can drive you crazy. And thanks to the creature's remarkable reproductive capabilities, mud-snail populations can reach swarm-like numbers very quickly. Females don't need males to impregnate them. They can do it on their own -- that is, asexually. They can also reproduce very fast. 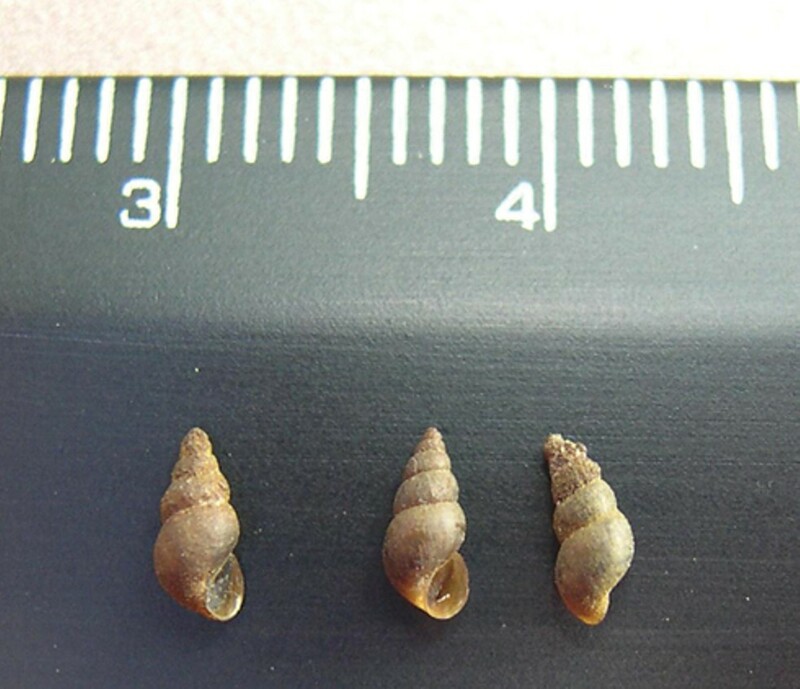 According to Darren Ward, an associate professor of fisheries biology at Humboldt State University and a neighbor of Bensen's, within a year a single snail can produce thousands of offspring. 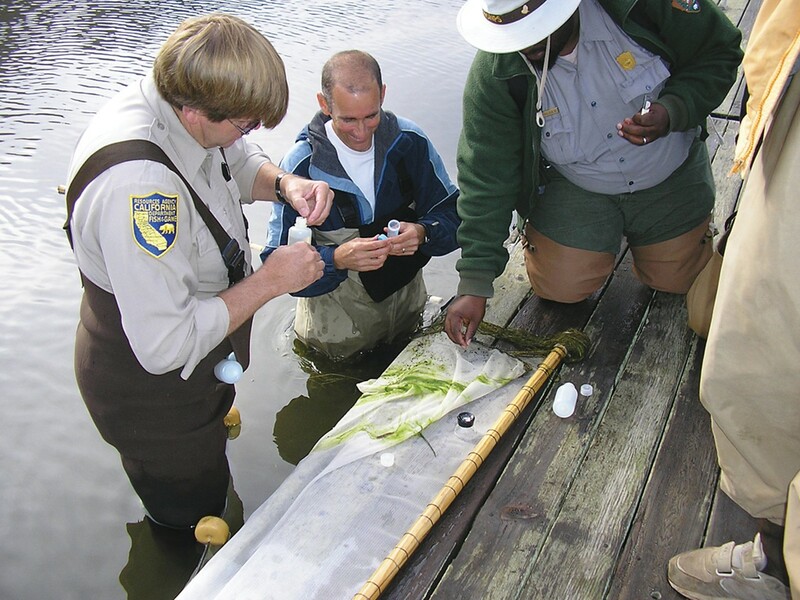 "One invasive snail is all it takes," Ward said. "They can become super-abundant." Ward is not exaggerating. Mud snails have been known to reach densities of 300,000 per square meter, 500,000 per square meter -- even, in a Swiss lake, 800,000 per square meter. In the water they are bottom feeders, grazing for the most part on algae. That's what aquatic insects in their larval stage feed on before they transform, in the flying part of their life cycle, into caddis flies, mayflies and stoneflies. Those are the bugs that fish such as salmon and trout feed on, not to mention streamside spiders, lizards, bats and birds. So what Bensen is worried about, essentially, is that by eating all or much of the food at the bottom of the food chain, the mud snail will negatively impact the entire network. "Through sheer numbers they can overwhelm the system," Bensen said. "By eating most if not all of the algae on the bottoms of streams and lakes, there's nothing left for anyone else." This ability to seize and occupy space, along with an appetite for slime, is reminiscent of quagga and zebra mussels, two aquatic invaders from eastern Europe that have had major impacts on the Great Lakes ecosystem. "Mud snails are definitely in that same category," commented Adam Sepulveda, an invasive species biologist with the U.S. Geological Survey's Northern Rocky Mountain Science Center in Bozeman, Mont., and a leading authority on the mud snail. "Like the mussels, they hammer the primary production." But don't the snails, by being so abundant, provide a feast for salmon and trout? Lab experiments, according to Sepulveda and Bensen, indicate otherwise. "In controlled situations we've seen that trout starve to death on these things, or have much less vigor," Bensen said. "Unlike native snails, the mud snail has a really hard shell and there's not much meat per mud snail. Imagine trying to survive on chicken bones or bran all the time." Not only are fish not getting a lot of nutrition out of the snails, the snails can survive ingestion by means of a nifty little device called an operculum. "It's a trap door that they can close over the opening of their shell," explained HSU's Ward. "If they close it after the fish eats them and they keep it closed, they can pass through the fish's digestive tract." Because the snail seems so problematic for fish, Bensen's fear is that the mud snail will push federally protected fish species in Redwood Creek, namely Coho and Chinook salmon and Steelhead trout -- fish that as a park service resource manager he's responsible for -- over the edge. "Even if the mud snail doesn't starve them to death, if the juvenile fish have lowered vigor and can't grow strong and big, they will be much weaker and more susceptible to predation when they migrate out into the ocean," Bensen said. "In that event, less adults will come back." Reports of mud snail sightings on the North Coast began popping up in 2008. But it was not until 2009 that mud snails were seen in Redwood Creek. When Bensen became aware that the snail was in his backyard, so to speak, he didn't simply stand around while his blood pressure shot up. He took action. Not to eradicate the snail, since no one knows how to do that. And not so much to limit its spread, although he has taken steps in that direction. No, what he decided was really needed was a research study that could assess the extent of the threat to an ecosystem that the mud snail has never been in before. "I don't have the local science that I can point to and say, ‘See, this is what will happen,'" Bensen said. So he sent out an email on a New Zealand mud snail research message board asking if anyone was interested in doing a mud snail study in his national park. It turned out someone was -- Sepulveda. The mud snail invasion of the Western United States began, or was first noticed, in 1987 in a tributary of the Snake River system in Idaho. Which immediately raises a question: How did a snail from New Zealand land in such a spot? One theory is that a fly fisherman, after trying his luck on New Zealand's waterways -- where trout were introduced in the 1980s -- inadvertently brought a snail or snails back with him on his gear when he returned to the United States. Then, still eager to fish, the angler took that same gear -- without first washing it -- to a side creek of the Snake and, presto, the snail had a whole new world to explore. That's one possibility. The other, favored by Sepulveda, is that the snails, attached to plant life in someone's aquarium, were literally poured into a new environment when someone dumped their aquarium into a creek. Either of those scenarios provides an explanation for an oddity: Even though there are literally millions of the snails now living in the U.S., they all belong to just three genetic clones -- one back East and two out West. "That suggests three different aquatic dumping events," Sepulveda said. Or, he allowed, three instances when a snail hitchhiked on an angler's gear. As for another seeming oddity, that virtually all the mud snails in the U.S. are female, Sepulveda just shrugged. "They just happened to be females" that were dumped into the environment, he said. He might have added that even back in New Zealand, where the mud snail indulges in both sexual and asexual reproduction, females vastly outnumber males. So have the mud snails wreaked havoc in the Northern Rockies, the place in the U.S. where they've been the longest? It's not clear. "Mud snails have the potential to have huge impacts, but we really haven't seen them in the field," Sepulveda said. 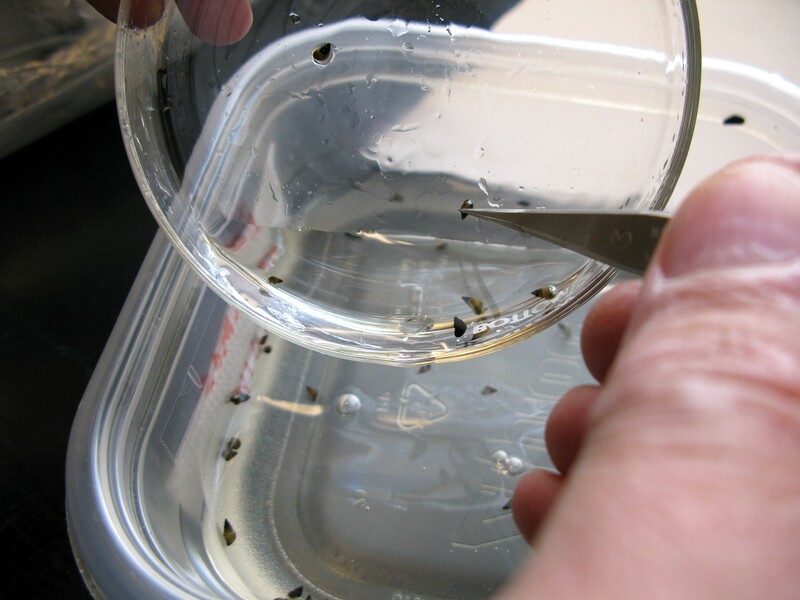 He cited a University of Wyoming study that found that while the snails consumed up to 96 percent of the available water plant life, there was no clear evidence of deleterious effects on insects and fish. "That makes sense," Sepulveda said, "if fish and insects weren't using that resource to begin with, if it was all just surplus in the system." Another possibility is that the snails engage in short-term feeding frenzies. "They might be having a pulse-like impact," Sepulveda speculated. "During two-week windows they go nuts and ravage everything. And then they stop and other things recover." The question of whether the snails are really a problem is important to resolve. If they're not, after all, there's no reason to spend public funds trying to get rid of them. "That's the important piece in terms of a public buy-in," Sepulveda said. "If you want funding to eradicate mud snails compared to other invasives you first have to show that these guys are actually having impacts." Speaking of other invasive species, Sepulveda said that contrary to conventional wisdom, most aren't that big a deal. "One of the cool but weird things is that 80 percent of all invasive species, both aquatic and terrestrial, have non-detectable impacts," Sepulveda said. "That's not to say they won't cause trouble if something [in the system] changes. But overall it's a relatively small handful of invaders that are causing huge problems." If the mud snail were in that category, the proof would be things like lower growth rates in fish, smaller fish populations and declines in the abundance of stream insects. A major reason getting that proof has been so difficult is that by the time scientists become aware of an invasion, the mud snails are already widespread. With no unoccupied creeks available for a comparison, it has been impossible to say with certainty how much damage the snails have done to the creeks they have invaded. Which is why Bensen's email got Sepulveda's attention. The thing about the Redwood Creek invasion is that it's relatively new. The snails, based on some survey work Bensen has done, haven't got very far up the river system. There are, in other words, unoccupied creeks that can serve as baselines. "When I saw Keith's email, I realized [Redwood Creek] would be an exceptional system to study," Sepulveda recalled. A colleague, Laurie Marczak, an assistant professor at the University of Montana, went further. "It's a perfect experimental set-up," Marczak enthused. "We can leap ahead of the invasion front to see what the system looks like before the mud snail gets there," she explained. "And then we can track changes as the invasion progresses." The pre-invasion picture is already somewhat clear, Marczak added, thanks to regular monitoring of fish and aquatic insects that the park service has done over the years. Sepulveda and Marczak, along with Ward, the HSU scientist, will be conducting the study, the initial stage of which is being funded by a $15,000 grant from the Save the Redwoods League, as well as a similar-sized grant from the U.S. Fish & Wildlife Service. Bensen is hoping that the Park Service can provide future funding for what could be a three-year study. 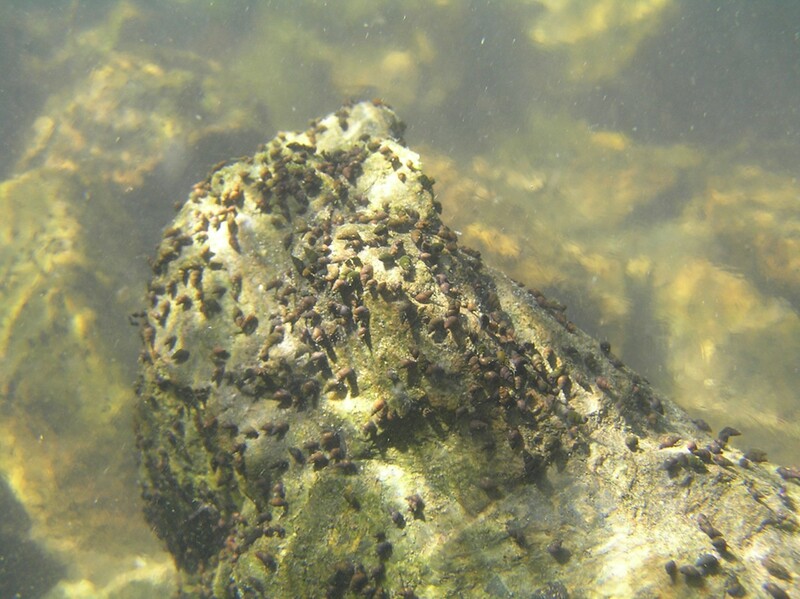 The study, which began in late May, seeks to determine the mud snails' impact on the diet and size of fish and amphibians, on the composition and abundance of emerging stream insects and on the density of the riparian spider population that feeds on those insects. "This summer will be a preliminary look," said Ward, a specialist on the survival and growth rates of juvenile salmon in freshwater before they head out to sea. "We'll get a better handle on the distribution of the mud snail in the basin. And we'll start measuring things that the mud snail might impact in areas that they haven't got to yet." In particular, Ward, who hasn't studied mud snails before, will be looking at energetics -- the amount of energy and growth in the undisturbed creeks versus the mud-snail infested creeks. As for salmon, one thing the researchers will particularly be looking at is body condition. "We want to see how much fat is on their bones because that's a good indicator of fitness," Sepulveda said. "We want to document that before the mud snails invade." Given that the salmon species in Redwood Creek are federally protected, a clear finding that the mud snail is harming them would have major ramifications. "If we can demonstrate impacts on a listed salmonid, then that's huge," Sepulveda said. Marczak won't be spending too much time with salmon. A food web ecologist and an expert on the interaction between stream organisms and those that live near streams, she'll be consorting instead with a somewhat less charismatic, although certainly more creepy, life form: spiders. Spiders, it turns out, are a good indicator of the health of a stream for the simple reason that they like to eat the bugs that emerge out of streams. For riparian spiders, as well as for riparian birds, "something like 40 percent of their diet is made up by emerging aquatic invertebrates," Marczak said. To determine spider abundance along Redwood Creek and its feeder streams, Marczak, along with a survey crew -- likely to be HSU undergrads -- will do a variety of things, not least counting webs. Referring to a common type of riverside spider known as horizontal orb weavers, Marczak said their webs are easy to count. For one thing, they have a distinctive appearance -- big with just a few spokes. For another, they're easily visible, anchored typically on boulders or rocks and hovering over water. And third, for a spider web, they are relatively long-lived. The orb weavers don't take their webs down each night like some spiders, Marczak explained. "They make a web and it stays put until it's completely trashed," she said. She's also going to be shaking bushes -- literally -- to see how many spiders fall out. The unlucky ones who do will land on a large sheet and then get deposited in a jar filled with ethanol that kills and preserves them for study back in the lab. As for the bugs that the spiders like to eat, Marczak is going to be capturing them for counting and inspection as well -- by planting "stick traps," bamboo stakes coated with a sticky substance, directly in the stream. To get a bead on the insect population while it's still in the larval stage, Marczak will place a net on the creek bottom and disturb the sediment immediately upstream so that whatever she dislodges ends up in the net. These, too, will be killed, preserved and taken back to the laboratory. When asked, Marczak confessed that she is not entirely comfortable with all the bug killing her work entails. "I like to tell people that there's a special Hell for field biologists," she said, half-jokingly. By getting the word out about the mud snail invasion in his jurisdiction, Bensen has avoided what would be special Hell for him -- not doing his job. But he's not optimistic that his actions in the end will do any good. "I pray there will be no impact, but I think the likelihood is high," he said. At another point, stepping away from his anxiety, he observed that what's happening with the mud snail in the Redwood Creek estuary, in Big and Freshwater lagoons and elsewhere is emblematic of a global phenomenon: Animals and plants are invading places they've never been before because humans beings, in just the last 100 years, have figured out global travel. "You had Gondwanaland and the plates broke apart and everything evolved in isolation. And then we come along and suddenly organisms and ecosystems that haven't seen each other in millions of years are coming into contact. "Most of them don't become invasive," he went on. "But once in a while an organism says, ‘Wow, I have no diseases or competitors or predators.' And then they go bananas." The New Zealand mud snail started traveling the globe in the 19th century, showing up in Britain in 1859 and then spreading to the European continent. Established populations also exist in Australia and Japan. In the U.S. the snail has been found in the Great Lakes and in every western state except New Mexico. The highest concentration ever recorded was in Lake Zurich, Switzerland. Over a seven-year period the mud snail colonized the entire lake, reached a density of 800,000 individuals per square meter, and then abruptly collapsed. Sudden population nose-dives have also been seen in streams in the western U.S. 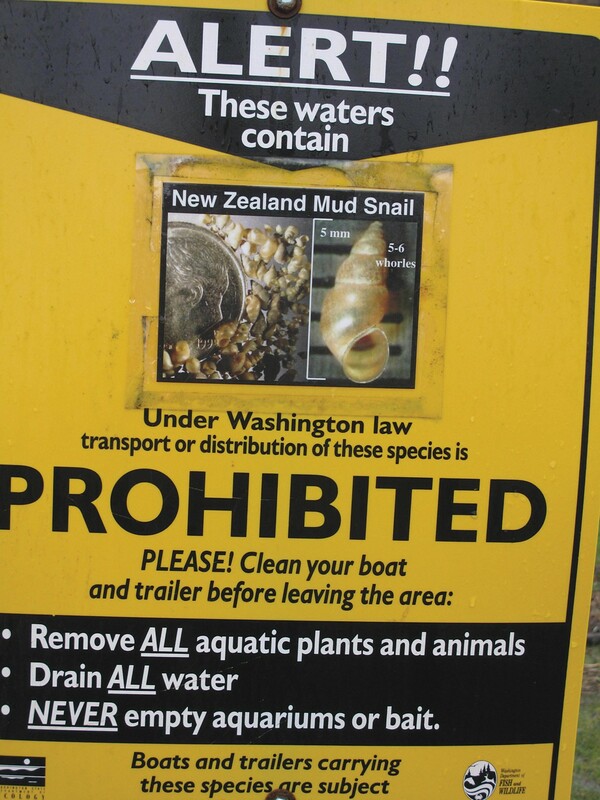 The mud snail has no natural enemies except in New Zealand, where populations are kept in check by a parasitic flatworm that sterilizes infected snails. It is also regularly crushed and digested by a fish with teeth in its throat. Mud snails can boogie. One experiment found that they could move upstream at a speed of three meters per hour. Studies are underway on how to get rid of the mud snail. Vacuuming them up has been shown to be effective but not precise -- other creatures get sucked up as well. Biocontrol, the introduction of predators and parasites that attack the snail in its native habitat, is also being looked at.